It was a week of firsts for Barb and I up here at the farm and one of the more physically exhausting weeks I have had in quite a while. With the weather cooperating all week we were able to work outside and get a lot of work done. Our first first of the week was cleaning seed. Who knew that harvested seeds have to be cleaned before you can use them in the next years planting? This week we cleaned both wheat and soy beans. Makes sense if you think about it but who ever thinks about it? Farmers that’s who! 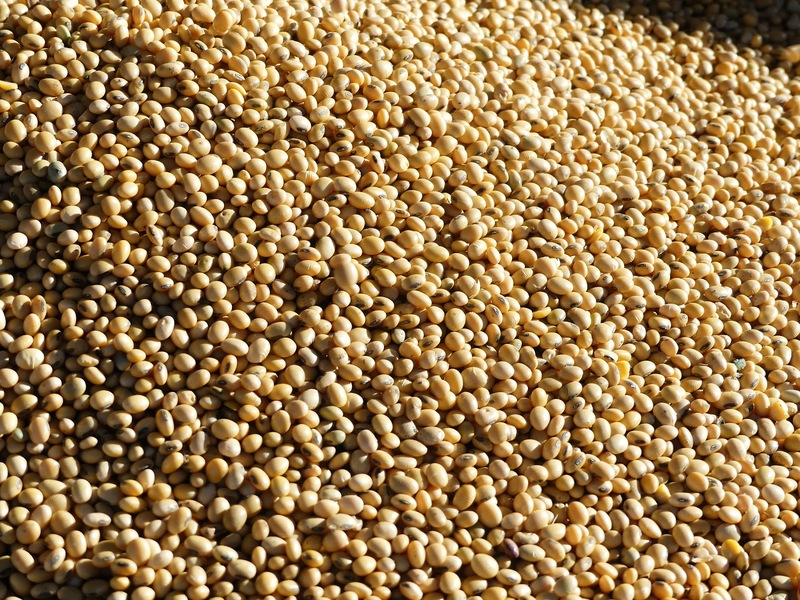 For example when soy beans and wheat are harvested they have to be removed from their hulls. The majority of them are discarded by the combining process but some make their way into the hopper and eventually into the grain bin. Speaking of hoppers, there are hoppers of a totally different kind that are a problem when it comes to cleaning beans. Grasshoppers. They are everywhere! They too get sucked up into the combine (along with lady bugs and other insects) and some make it into the grain bins. Last but not least is weed seeds. Although they control their weeds there are enough that survive to make them a problem. Scoop up a handful of beans and you don’t see them but if you look very carefully you might find a few seeds and the last thing you want to do it plant lady bugs or weeds along with your soy beans! 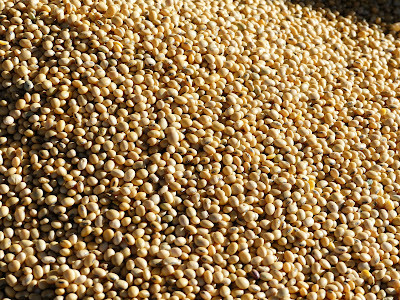 So how do you clean soy beans? Certainly not individually with Barb’s toothbrush! They have a huge grain and seed cleaner that uses air and screens to weed (pun intended) the bad seeds and other debris. Follow closely as this is quite the process! First we took the beans out of the bin they are stored in. Then we moved them over to a lift truck and dumped them into the box. You have to really control the flow going into the cleaner so it is important to have the opening just right. That then dumps into a conveyer and up the auger into the hopper of the cleaner. The cleaner has a series chambers that you can control the air flow and bounces/floats the seeds across the chambers and separates some of the debris based on its density. Anything lighter and heavier than the soy bean gets separated. It then moves onto a series of screens where anything larger or smaller than the beans are screened out and separated as well. The debris, split seeds or smaller seeds go one way and the desirable seeds go another. 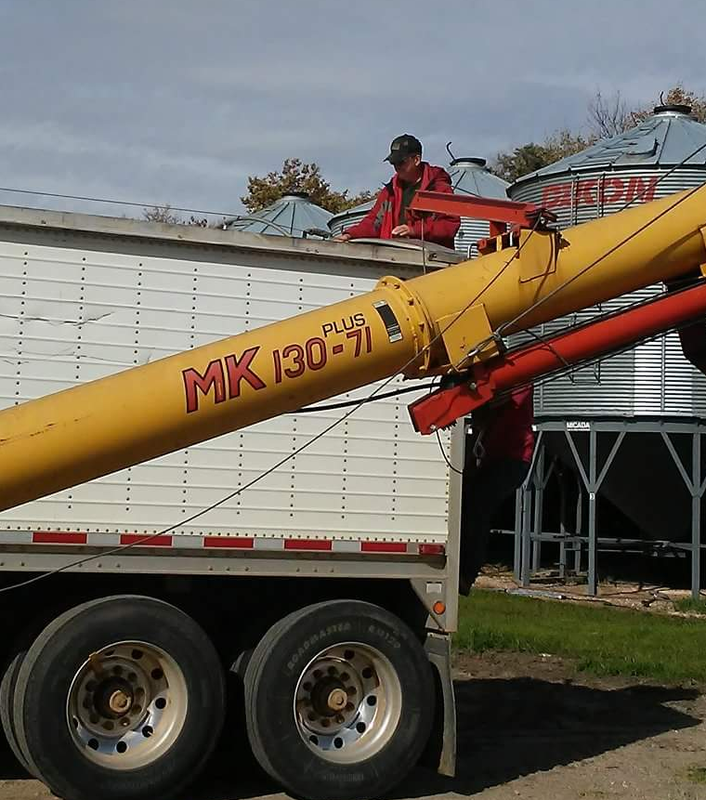 If I were to guess I would say 10% or less of the load goes down the undesirable conveyer while the good seed follows another conveyer and up an auger into another grain bin. The PTO on green tractor powers the auger taking the clean beans up into their new home! Simple right? Well setting it up is quite the process and takes an hour or more. Setting the air flow for density is an art in itself and once you get started you don’t want to stop until the entire bin you are working is empty and at a cleaning rate of ~400 bushels/hour and a 4000 bushel bin to clean, we were in for the long haul. A process that started at 9:00am with set up ended at 11:45pm when we finally turned off the cleaner (this did not include the 1 ½ hours of cleanup and tear down the next day). Clean beans ready for planting! I realize that this was a lot of detail on something most of us never knew ever even existed but hopefully you found it as interesting as I did. 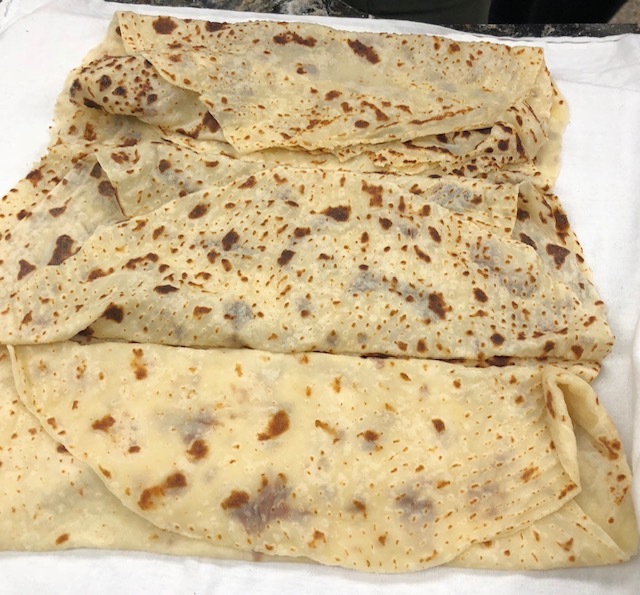 The other first this week was Barb attending a Lefse making class. 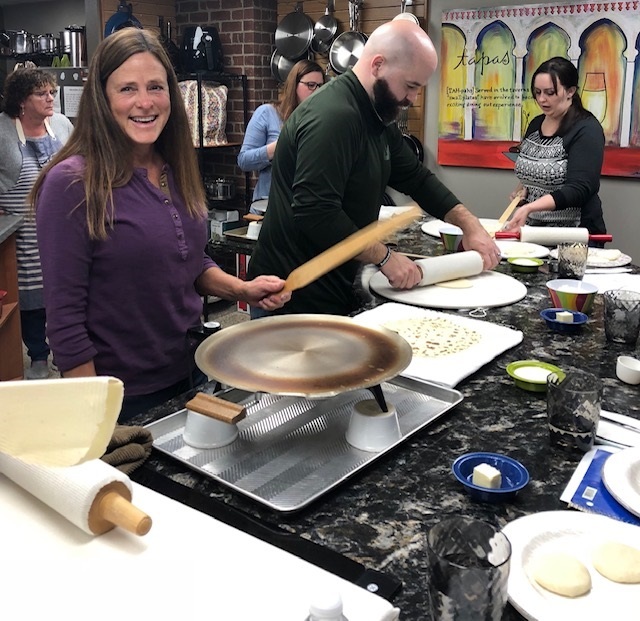 I am always looking for new and delicious foods for Barb to make me so when I saw this lefse class on line in Minot I knew we had a winner! 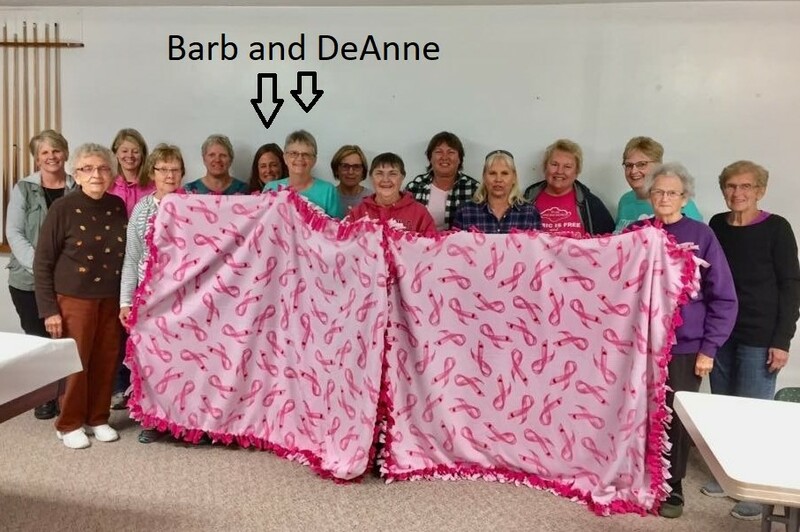 Well, maybe it didn’t happen quite that way but Barb did attend this class last week with her friend Jeanie. I won't go into great detail on how they make lefse but one thing I did not know is that they are made out of potatoes. The other thing I will tell you is that they were delicious! The another first for the week was Dylan being nominated the FFA (Future Famers of America) National Star Farmer Award. 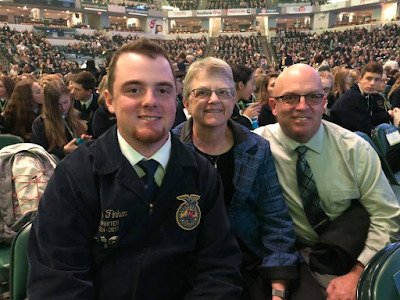 One of 4 finalists from across the country, Dylan, DeAnne and Bob flew Indiana to attend the national convention in Indiana. Dylan did a great job and made his family proud, here is a link to his video. Barb said now that I have done dishes professionally I should be able to do them at home. 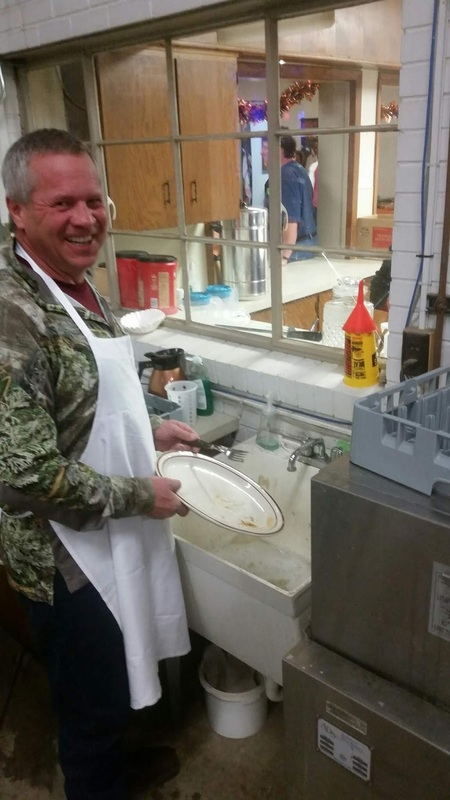 Unfortunately none of the skills I learned at the steak fry were transferable to life in the rig! This is our 4th straight year attending the steak fry and we always have a great time. 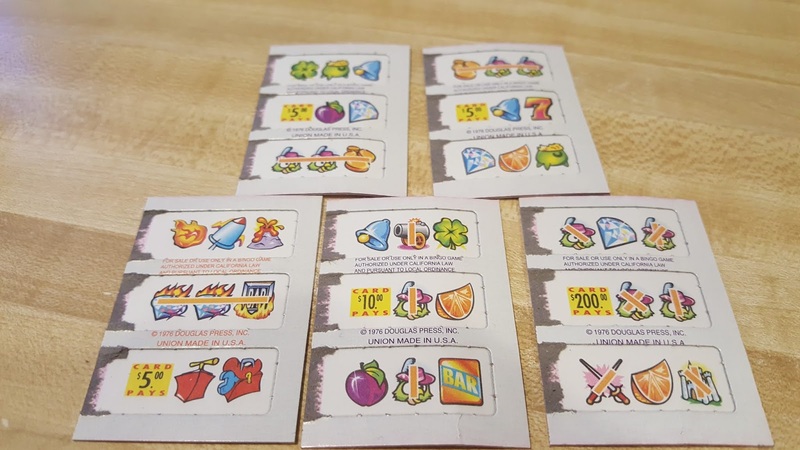 We usually end up at the Max bar doing pull tabs afterwards but last year after losing our @sses for two straight years we vowed we would not do it again, instead opting to stay at the event and play black jack. So true to our word we played black jack for an hour and a half and …..lost everything. So what did we do next? 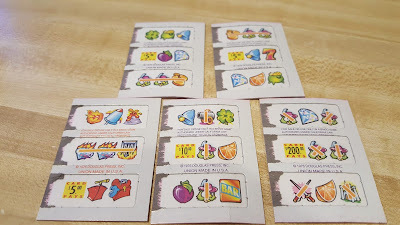 We went to the Max bar and starting in on the pull tabs! But this time we won! Weather permitting, we have 11 days left here. Although there is snow in the forecast it looks like the temperatures are going to be mild and we are going to make it! John and Mary could not believe their luck, as John’s father had just bought them 160 acres of prime farmland in the heart of North Dakota and in 1916 that was a lot of land and even harder work. Day by day they worked the ground and over time they had themselves a beautiful farm! Those were the humble beginnings of the Finken Farm back in the day. In that era farms were pretty much self-sufficient units meaning that you relied solely on yourself for everything you need. They had a dairy cow or two for milk and cream. Chickens and other livestock for meat and you raised your own grain for flour and to sell at market. Through hard work and dedication John and Mary farmed the land, raised and supported 4 children on that 160 acres and added another 280 acres. One of the children, Wilmer, stayed on the farm after growing up and married Isabelle. They in turn raised 5 children on that same property in the same self-sufficient manner although now the acreage had increased to 1040 acres. Sharon, Kathy, Dennis, Bob and Elaine were hard working farm kids as they grew up. All of them except one eventually left the farm to pursue other careers and lives of their own. Bob was the one remaining child who stayed on the farm and when his father became ill at the age of 58, 18 year old Bob found himself the caretaker of the farm and has been at it ever since. Bob married DeAnne, a farm girl who he had known since the 2nd grade and lived within a few miles away. Together they raised 4 children and increased their operation to over 6,100 acres of owned and leased property, 4500 of it tillable. It is interesting to see how the farm has changed over the years. The progress in farm equipment, the buildings and the farming practices. In the early days they used to cut wheat with a hand scythe hopefully getting an acre or two done in a day. Today they use combines which can cost upwards of $500,000 and can harvest 20 acres an hour. They no longer have livestock on the farm. Eggs, milk and meat are now bought at the grocery store as they focus on crop production for their income. Although they are successful, I would say it is far from an easy life. Hard work, sweat and prayers going into running a family operation like this. So much of what they rely on is out of their control. Mainly weather, but also national and global crop prices and unforeseeable equipment breakdowns all have an impact on their daily lives. This is our 5th year of coming up here and so far this year we have been here a combined 10 weeks, longer than any other place. As we help out and work the fields I get a sense of what Bob has experienced his entire life. Working each acre of land foot by foot several times a year at less than 3 mph you get to know it intimately. The dips, the rises, the rock that is just too big to dig out, what crop was on there last year and the year before, where you jumped a big buck or a nye of pheasants. As these memories are created for me, I cannot help but think of how vastly small they are compared to the memories and years of hard work Bob and DeAnne have put into it. Driving the roads around the area we see this scenario played out time and time again, each acre of land having its own history, its own tale to tell. Some made it and some are fading off into the sunset. Bob is the 3rd generation on the farm, the 4th if you count his great great grandfather who bought the property for his son and lived on the farm as well. He and DeAnne have lived most of their lives within a 10 square mile area of their farm and comparing our lives to theirs, they could not be more different. Both Barb and I were raised in more or less suburban environments with parents and our own careers being vastly different than Bob and DeAnne. But we are both mysteriously drawn to this lifestyle and these people. Maybe it is the sense of community, family and working with your hands. Both are board members of various organizations and deeply involved in the church. Hardly a day goes by they don’t have something going on that they have to go to a meeting or a function. Bob and DeAnne have raised 4 children of their own. While two have moved away, Holly and Dylan are still living on (or within 3 miles) and are actively involved in the farm that make the 5th generation. With Chris and Holly’s kids the 6th generation is growing up right here on the same property as their great, great, great, great grandparents. Absolutely amazing! If you look real close you can see our rig on top along side the bins! 2017 Chris and Holly built a new house (middle left) and had their old one removed. The red barn is gone, even more bins on the east side. Although we love our lifestyle, we cannot help but be envious of what they have and could see ourselves doing exactly what they are doing in another life. Of course I will be taller and built like John Wayne and Barbie? I will take her just as she is! So what have we been up to the last few weeks? Two weeks of freezing temps and snow kept us out of the fields. But that does not mean the work stops. Instead of harvesting crops we pulled everything into the shop and spent time performing maintenance on the combines, changed the oil/fuel filters in the truck. 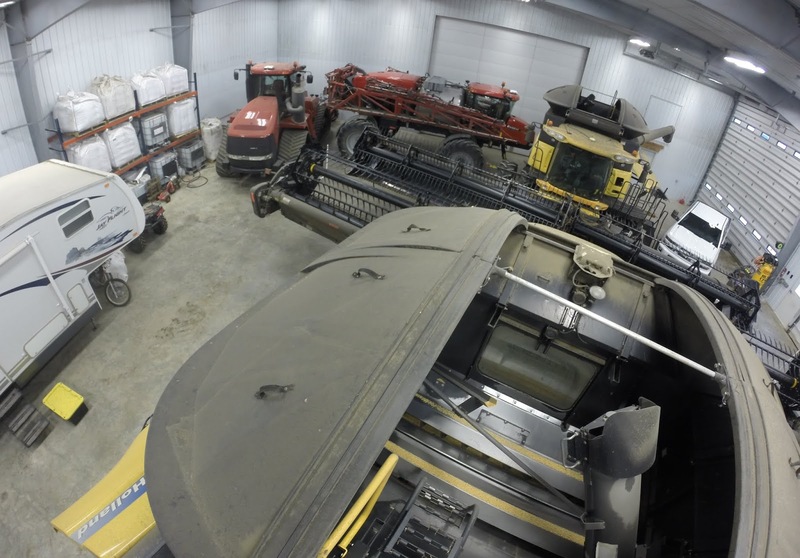 2 combines, the sprayer, quad tractor, 5th wheel, a truck and room to spare in this 80'x166' shop! And thanks to our friends at RV Solar Solutions, we replaced the batteries in the rig having them shipped directly to the farm! All done and ready for some boondocking! When the weather was somewhat bearable I got out and tore down an old fence line, picked rocks and got more duck hunting in. Barb has become quite crafty in the past couple weeks taking some old mason jars, painting them, distressing them, sealing and putting designs on them. They actually turned out really well! She put a sticker on the jar, painted over it and removed the sticker. Then placed a candle it in, very cool! She also found some old barn wood and has also been doing on a couple of woodworking projects; a frame for a picture and a table top for Dakota's dog crate. Not quite finished but looking good so far! Once the cold weather pushed out we again saw temps in the 50's, 60's and even one day that hit 70! We took full advantage of it and over the next 7 days we hit the fields hard harvesting ~900 acres of soy beans. For the most part I ran the grain cart and hauled beans to the elevator when we ran out of room at the farm. With every farm in the county at a stand still for the past two weeks there was a huge push to get the harvest complete. What happens when everyone brings their crops to the elevator at the same time? They run out of room as well and have to pile it up outside! I did get about 4 hours in the combine as well. There were some long, long days but as of 9:00pm Saturday night the last bean went into the combine and the harvest is done! Now it is time go get the fields prepped for next year and see about getting out and do a little bow hunting for deer! If you don't like the weather, wait 5 minutes, it will change. That should be the slogan on the North Dakota license plate. This past week we have experienced everything from 70's to 20's, rain, high winds, even snow and sleet! When we arrived at the farm last week and it looks like they were expecting us! There are several things we love about coming up here; seeing Bob, DeAnne, Chris, Holly and Dylan, hunting and getting some tractor time in. Truth be told, Barb would probably agree with one of those three.... One of the first orders of business was to pay off a bet with Bob earlier in the year. He bet that he could lose 12 pounds before we returned. Not only did he achieve this goal but he smoked it and blew right past it! 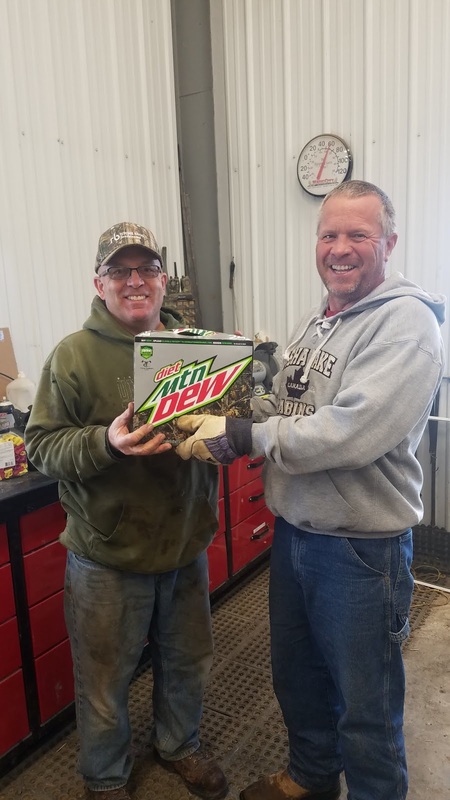 A well earned case of Diet Mountain Dew! They were about 75% done with their harvest when we arrived; wheat, field peas, canola and chick peas were all done. Luckily for me, they still had about 1,000 acres of soy beans left in the field so it looks like I will get some farm work in! This week I was able to get some tractor time in but the weather wreaked havoc on the fieldwork so it was not as much tractor time as they would have liked to see me have. A first for me was when they asked me use the Landoll Highspeed Disc to break up some former CRP ground that is going to be planted next year. 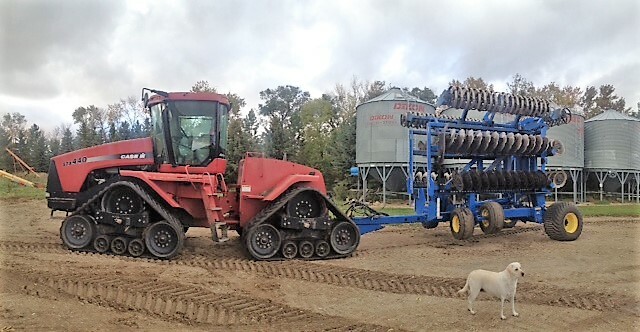 This piece of equipment uses a series of disks to break up the ground preparing it for planting. Since this ground had not been farmed in years I had to go over it several times in different directions to get it broken up. It is not ready for planting yet but with a little more work it will be ready for next year. We only got out in the field to harvest soy beans for two half days as the moisture has to be just right for harvesting but they made the most of it and got 285 acres done. Chris, Bob and Dylan operated combines while I ran the grain cart emptying the beans into the semi and then drove the semi back to the farm and emptied the beans into the grain bins. The beans go from the semi into the auger and up the auger into the grain bin. Of course before you can put the beans in the grain bin you have to clean it out to make sure there are no remaining seeds from whatever was in there last. It is a dirty little job but not too bad. You basically clean it out with an air compressor and work out any seeds that are stuck in crevasses with a pick. It is hard to take a picture of the inside of the bin but here is my best attempt. 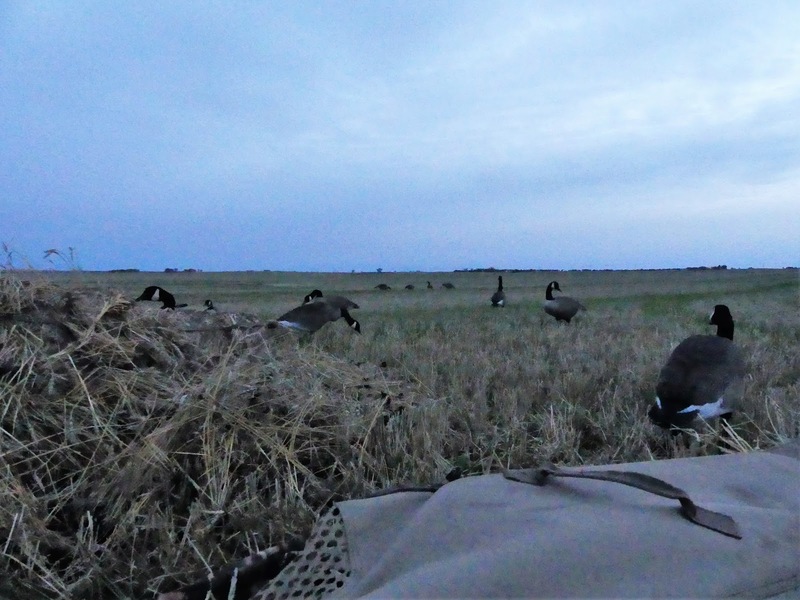 The upside to wet, windy and cold weather is that it is great for duck hunting so we took advantage of that and got out in the field several times. 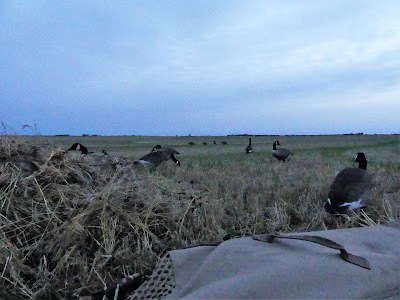 We scouted the night before to see which fields the birds were frequenting and set up in those fields at 5:30am the next day putting out about 10 dozen goose and mallard decoys as well as setting up layout blinds to conceal ourselves. Sun is up and we are ready for the birds! The birds start returning right after sunrise and we were there waiting for them! Between the four of us, the first day we got a limit of mallards and 5 geese, the second day we 15 mallards and 6 geese. This is Dakota's second duck season and although she did not go out on the field hunts we did get her out to a couple of waterside hunts. Since she is a mama's girl and only been out hunting a couple of times a year ago, Barb came along to help her feel more comfortable. I have to say she exceeded my expectations as she was not gun shy at all and in fact was excited every time I shot as she knew she got to go swimming after I shot. Well, not every time, in fact she would look at me disdainfully whenever I missed a bird! Throughout the hunts we got mallards, scaup, ringbills, teal, pintails, gadwalls and the ever present shoveler. With all the muddy water she is playing in I would not be surprised if we ended up with a black lab rather than a white lab by the end of the season! We also had our first ever Finken Farm visitors when Jim and Brenda stopped by as they are making their way east from Teddy Roosevelt National Park to Indiana. We visited for a few hours and I even got Jim out in the field to load a semi and bring it back to the farm and unload it. We hope to see them sometime this winter in Florida, if that does not work we will not see them until we return to South Dakota in April. Not to be outdone Barb, DeAnne and Holly went out to have some fun of their own by attending the 5th Annual Tying for Support (which DeAnne hosted) event at the Douglas Senior Center. 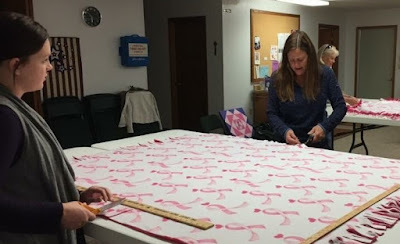 It is a blanket tying event where the completed blanket are donated to Pink it Forward . Barb said it was a great event and met some very nice people. Last post I left you with a screen shot of the upcoming weather forecast thinking how cold it was going to be, little did we know that those were going to be the warm days as this week looks even colder and snowier! Doesn't look like we will get in field this week!